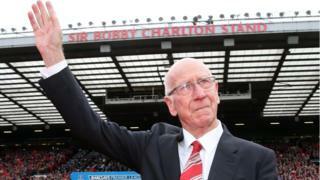 Image caption Sir Bobby Charlton said the renaming of the stand was "a great honour"
Manchester United have renamed Old Trafford's South Stand in honour of Sir Bobby Charlton. Fans held aloft coloured tiles, spelling out his name, before the Premier League match against Everton. Club director Charlton, 78, joined United in 1953 and made 758 appearances, scoring 249 goals. A member of the England team which won the 1966 World Cup, Charlton won four league titles with United and the 1968 European Cup. The retired midfielder was one of the survivors of the Munich air disaster, which killed eight of his team-mates in 1958. The South Stand, which contains the only remaining part of the original 1910 stadium infrastructure, houses the directors' box.